Database of Music Business Conferences in Europe. Pick your poison. Mastering The Music Business showcase festival & conference is the leading professional event for the Romanian music industry. It was founded in 2016 with the aim of connecting local artists and music business professionals with their peers from all across Europe and increasing the mobility of Romanian musicians abroad. Switzerland’s m4music is the most important showcase festival of the country’s independent music scene. It’s the ideal place to discover emerging artists, and to meet and connect with Swiss music business professionals. MENT is a three-day showcase festival of fresh artists from all of Europe and beyond, during which around 70 acts perform at different venues around Ljubljana. The international conference focuses on the music industry and creativity. PIN is the first and only international music conference and showcase festival in Macedonia. BuSH represents the best that the Eastern-European music industry has to offer. Showcase event for the best regional bands and professionals. Sonic Visions is a music business conference and a showcase festival in Luxembourg City. The event is for artists and professionals all over the music industry. Nouvelle Prague is the first music conference in Czech Republic, and unlike other similar events, it is primarily focused on overseas bands. The biggest gathering of the world music scene, featuring a trade fair, conference, films and a showcase festival. Three decades full of music, insights and encounters. PopMid is a Music Industry tradeshow with a twist. It has no specific focus or theme and hosts the entire industry spectrum, from physical sales and distribution, content creation, management and licensing, consultancy, to digital services, distribution and promotion. PopMid was founded in response to the high entrance fees for established music industry trade shows and conferences, the decreasing features and services these offer, the declining attendance over the last couple of years and the diminishing returns these issues result in. We hear more and more from people and companies who are now seriously considering not attending the bigger trade shows. Linecheck is a music festival and meeting point for industry professionals, held in the Italian city of Milan. Linecheck is a part of the Milano Music Week. It presents an extensive program of talks, showcases, discussions that explore Italy’s music industry and it’s relationship with the global scene featuring international players and the major protagonists of Italian industry with dozens of guest speakers. Loftas Fest is one space that connects music, street art, installations, modern dance, theater, design and much more. Live at Heart is one of the biggest showcase festivals in Scandinavia. Set in Örebro, Sweden LAH offers networking opportunities for artists, startups and film industry. Live at Heart is all about lectures, seminars, workshops and networking activities on subjects related to music, film, entrepreneurship, and business. Genres include pop, rock, heavy metal, electro, folk, jazz, country, blues and many more. Monkey Weekend is a sister event of Monkey Week. Takes place in Seville, Spain, in June. Primavera Pro is a global meeting point for the music world, opening a window on what’s new and the challenges of an industry that is in constant evolution. For 5 days, the state of the music business is debated with the best-known experts in the field, showcasing dozens of newcomer bands and giving access to all the tools necessary for the professionals from all around the world who attend the meeting. Focus Wales is an international multi-venue showcase festival taking place in Wrexham, North Wales. At Focus, you’ll find interactive industry sessions, stand-up comedy, arts events, and film screenings. Liverpool Sound City festival is known for its inventive use of a wide variety of spaces, from cavernous warehouses to setting up a stage on the banks of the Mersey. The musical focus of c/o pop is on German acts and artists. Festival & conference showcasing fresh and sharp music from Slovakia, Europe and beyond. Enea Spring Break is Poland’s biggest showcase festival. It takes place in Poznań, and features artists from Poland and abroad. Poland is one of the growing markets in Europe’s music business. The network forum of the concert industry, which brings together the key participants, market experts and musicians. Music showcase festival of the world-famous “music week” format. Within а few days, musicians of various genres perform at the same time in many different areas of Kyiv. Westway LAB Festival is Portugal’s first showcase festival, featuring a conference for professionals and artistic residencies yielding unique performances. This four-day festival takes place in Guimarães, Portugal. What’s Next in Music? is an international showcase festival and conference on innovations and new opportunities in music industry. WNIM is organised by the Lithuanian music business association, held annually in early September in Vilnius, the capital of Lithuania. WNIM used to be called Vilnius Music Week, until 2015. Registration starts in June, each year. 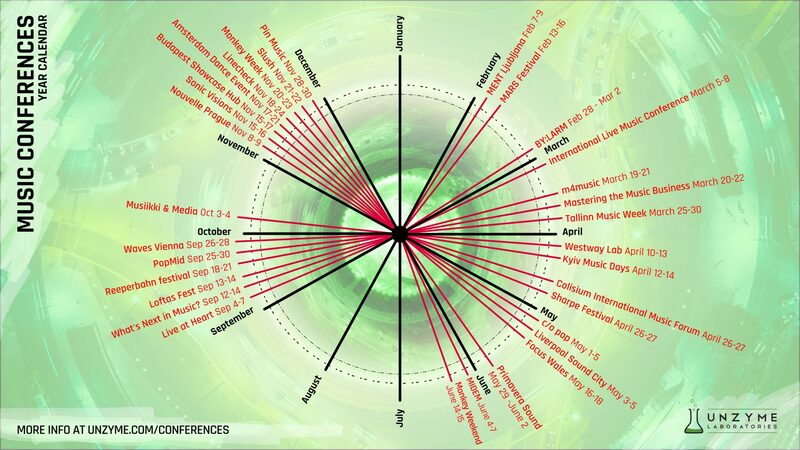 A showcase festival and a music business conference in Oslo, Norway. MARS – Music. Assembly. Research. Showbusiness. ESNS is dedicated to European artists. Eurosonic is a showcase festival and a music conference, much like Reeperbahn Festival and Tallinn Music Week. Emphasis is on introducing artists to the international music scene. ESNS brings together 4 000 conference delegates, including 400 international festival promoters, and showcase festival people. The showcase festival features around 350 European artists, which perform to a total of 40.000 visitors every year.